The former leader, Nawaz Sharif has alleged that cases against him and his family were being fabricated and that the Panama Papers case verdict became a source of embarrassment for the nation, Dawn News reported. On October 26, the court issued bailable arrest warrants against Sharif after he failed to appear before the court in connection with the three references filed by the NAB. Ousted Prime Minister Nawaz Sharif arrived in Pakistan on Thursday and will appear before a court on Friday in connection with the corruption references filed against him by the National Accountability Bureau (NAB). Sharif landed at Islamabad’s Benazir Bhutto International Airport at around 8:20 am., reports Dawn news. A large number of Pakistan Muslim League-Nawaz (PML-N) supporters and party leaders were at the airport to welcome him. Minutes after landing, Sharif left for Punjab House where he is expected to address a meeting of party workers later in the day. The former leader has alleged that cases against him and his family were being fabricated and that the Panama Papers case verdict became a source of embarrassment for the nation, Dawn News reported. On October 26, the court issued bailable arrest warrants against Sharif after he failed to appear before the court in connection with the three references filed by the NAB. The warrants were issued for the Flagship Investment case and the Al-Azizia Steel Mills and Hill Metal Establishment case. The court had indicted Nawaz Sharif, his daughter Maryam Nawaz and her husband Captain Mohammad Safdar on October 19 in connection with a case pertaining to their apartments in London. All three pleaded not guilty to the charges, reports Dawn news. 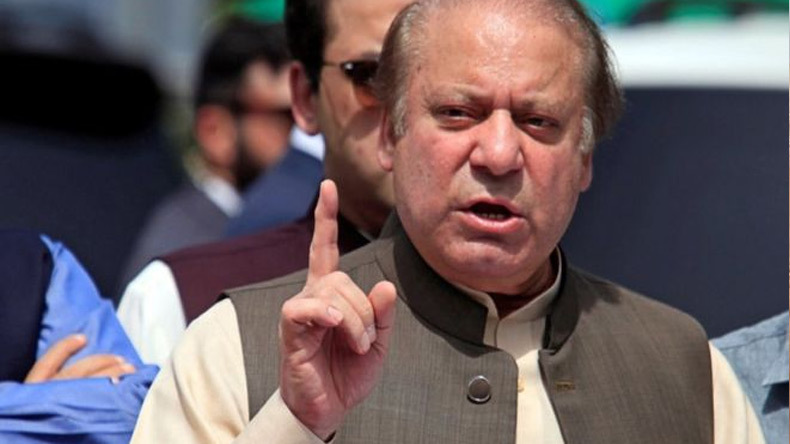 A five-member bench of the Supreme Court on July 28 had directed the NAB to file cases against Sharif and his children in six weeks in the accountability court and directed the trial court to decide the cases within six months. The former premier and his two sons have been named in all three NAB cases, while Maryam and Safdar were named only in the London case.